Recording tips and techniques for your low budget home studio. So I know there might be questions about setting up and how to configure your DAW (Digital Audio Workstation), and if that's the case email me with your questions and I'll do my best to answer. The next piece is about using effects properly and adjusting the tone. I personally use impulses and simulators. Here's a screen shot of the names of the effects I use, which you can google search and download for free. If you want to use the same plug-ins as me save them all in a folder after you download them. Load them into Reaper in the same order I have mine. Now since every guitar is different and everyone's sound will be different the only suggestion I can make here is to keep tweaking the sound until you find something you like. I have a preference for very heavy sounding distortion, in case that makes a difference. If you go the other way and use plug-ins that are ready right out of the box, Amplitube and/or Guitar Rig are my choices. There's such a huge variety of tones, and effects that you can never get bored playing with either of these apps. Below is a screenshot of reaper with all the effects I use and how I dial them in. It's not my exact tone that I use in my recent tracks, but if you try to get something similar out of these, you'll start to understand how these work. I hope you find some use out of all of this, and again if there's questions just email me and ask. My email should be in my profile page. Next up, EQ. 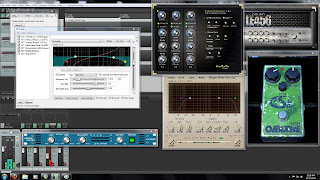 You'll notice that you'll have too much low end or high end in your sound, so I'll go through how to use built in EQ's or downloadable plug-ins. Copyright JFoBTQ 2011. Awesome Inc. theme. Powered by Blogger.